Infrared thermometers house optics that collect the radiant infrared energy emitted from an object and focus it onto the detector. The detector converts the energy into an eletrical signal, which is amplified and displayed. An infrared thermometer is often used for preventitive maintenance, troubleshooting, and quality control. 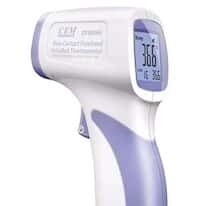 When choosing an infrared thermometer, consider the temperature range required; size, material, environment, and distance of the measured object; and its spectral response.